Second Chance World Tour: The Best People Ever!!! Who am I going to meet on this world wide, year long, solo trip? So who am I going to meet? I’ve found over the years that people talk to me. For some reason they tell me the most intimate details of their lives. My daughter was amazed: “Mom, that lady in the dressing room just told you her life’s story. Why?” Well, maybe I look kind, feel trustworthy or sound sympathetic. Or maybe because as a Doctor and Hypnotherapist I’ve learned to listen. Most of us just want to be listened to. Our stories respected. My trip started with a 7 hour layover in the London airport.Yikes! Boring! And exhausted from a sleepless night on a cramped seat. Yet with no expectations, I found it fascinating. People everywhere to observe and talk to. Sitting next to me at a restaurant as I drank a lovely pot of real English tea was Leslie, an American law student with a fascinating experience in the Peace Corps in Africa. And beside me on a bench sat Kojo from Ghana who told of early experiences of racism in England and how things have improved. 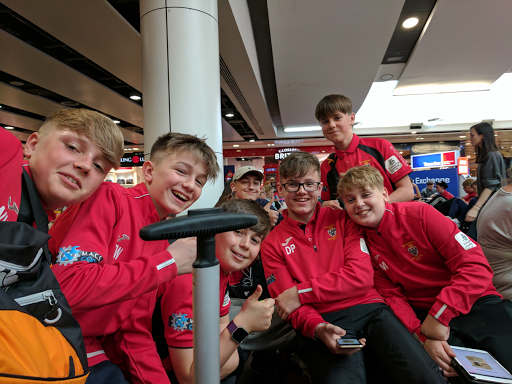 And the best of all, was a soccer team from Smaith School in England, who taught me what to expect from this trip around the world. Wow! What a bunch of lively bright eyed interested 13 year olds! On their way to play at an event in Barcelona, they peppered me with questions. Have I seen alligators? Where was my husband? Have I been to Boise? (Fortunately no political questions.) When I told them I was writing a blog, they immediately pulled it up on their phones. I told them they give me hope for the future with their inquisitiveness and spirit.